Practice Wireless & Mobile Communications questions and answers for interviews, campus placements, online tests, aptitude tests, quizzes and competitive exams. This set of Wireless & Mobile Communications Multiple Choice Questions & Answers (MCQs) focuses on “Frequency Division Multiple Access (FDMA)”. 1. Frequency division multiple access (FDMA) assigns ______ channels to _______ users. Explanation: Frequency division multiple access (FDMA) assigns individual channels to individual users. Each user is allocated a unique frequency band or channel. These channels are assigned on demand to users who request service. 2. During the period of call, other users can share the same channel in FDMA. State whether True or False. Explanation: In FDMA systems, no other user can share the same channel during the period of call. In FDD systems, the users are assigned a channel as a pair of frequencies; one is used for the forward channel while the other frequency is used for the reverse channel. 3. The FDMA channel carries ____ phone circuit at a time. Explanation: The FDMA channel carries one phone circuit at a time. Each individual band or channel is wide enough to accommodate the signal spectra of the transmissions to be propagated. 4. If the FDMA channel is not in use, it can be used by other users. State whether True or False. Explanation: If an FDMA channel is not in use, the it sits idle and cannot be used by other users to increase or share capacity. It is essentially a wasted resource. Explanation: The bandwidth of FDMA channels is relatively narrow as each channel supports only one circuit per carrier. That is, FDMA is usually implemented in narrow band systems. Explanation: The symbol time of a narrowband signal is large as compared to the average delay spread. This implies that the amount of intersymbol interference is low and, thus, little or no equalization is required in FDMA narrowband systems. 7. Due to _________ transmission scheme, ______ bits are needed for overhead in FDMA systems. Explanation: Since FDMA is a continuous transmission scheme, fewer bits are needed for overhead purposes (such as synchronization and framing bits) as compared to TDMA. 8. Which of the following is not true for FDMA systems as compared to TDMA systems? Explanation: FDMA systems have higher cell site system costs as compared to TDMA systems. It is due to single channel per carrier design, and the need to use costly bandpass filters to eliminate spurious radiation at the base station. 9. __________ is undesired RF radiation. Explanation: Intermodulation (IM) frequency is undesired RF radiation which can interfere with other channels in the FDMA systems. The nonlinearities cause signal spreading in the frequency domain and generate IM frequency. 10. ______ is based on FDMA/FDD. Explanation: The first US analog cellular system, the Advanced Mobile Phone System (AMPS) is based on FDMA/FDD. A single user occupies a single channel while the call is in progress. 11. In US AMPS, 416 channels are allocated to various operators with 10 kHz guard band and channel between them is 30 kHz. What is the spectrum allocation given to each operator? Explanation: Spectrum allocated to each cellular operator is 12.5 MHz. As Bt=NBc+2Bguard; which is equal to 416*30*103+2(10*103) =12.5 MHz. 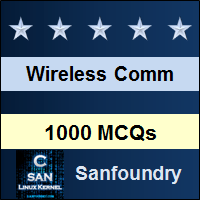 Sanfoundry Global Education & Learning Series – Wireless & Mobile Communications. To practice all areas of Wireless & Mobile Communications, here is complete set of 1000+ Multiple Choice Questions and Answers.